1 of 3 Place almonds in a small nonstick skillet. Toast over medium-high heat for 4 minutes, shaking pan, until lightly browned. Remove from heat; set aside. 2 of 3 Trim cabbage. Cut lengthwise into quarters, then crosswise into thin shreds; put in a large bowl. Add carrots, basil and peas. Toss to combine. 3 of 3 In small bowl, whisk together rice vinegar, soy sauce, sugar, sesame oil and salt. While whisking, add vegetable oil in a thin stream, until blended. 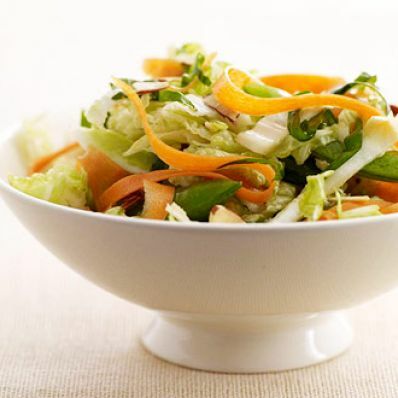 Sprinkle almonds over cabbage mixture; drizzle slaw with dressing. Toss to combine and serve. Per Serving: 1 g sat. fat, 0 mg chol., 123 mg sodium, 3 g fiber, 9 g carb., 11 g Fat, total, 158 kcal cal., 4 g pro.